The last few years have proven to us that F1 teams do not care for aesthetics and performance is their primary concern. Personally I didn't have a problem with the 'Step Noses' of 2012 as it was was more of a design born out of necessity. 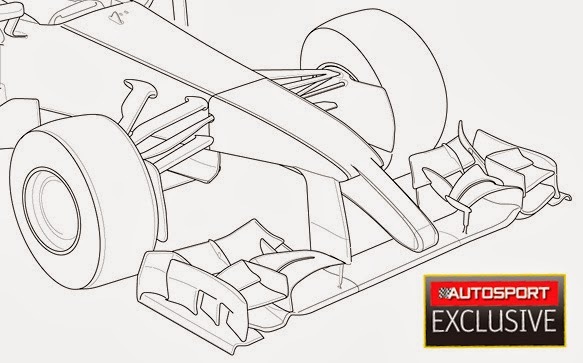 With the FIA lowering the height for the nose tip to 550mm whilst the chassis height limit was 625mm, it was obvious that those desiring to drive more air under the nose would raise it's tip to the maximum permissible height. For 2014 the FIA have once again left the regulations open to interpretation hoping the teams would see them on face value. 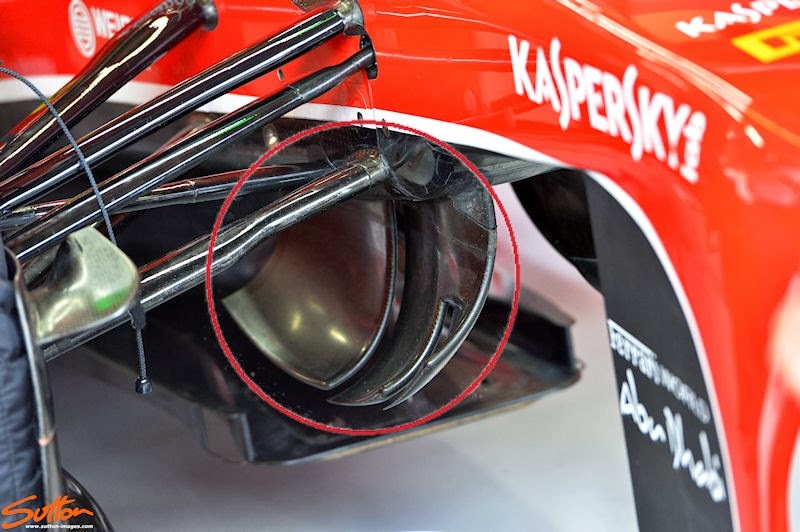 Of course the teams won't do this and instead opt for the most aerodynamically efficient manifestation of the regulations to satisfy their need for performance. The image above perhaps depicts best the interpretation with which the FIA wished the regulations to follow, there are of course several factors however that dictate the teams will carve their own directions. We must first look at the last few seasons and understand that teams have taken a path that allowed them to raise the tip of the nose to the highest point. This allows more airflow to be directed at the floors leading edge which is conditioned before reaching the Diffuser at the rear of the car. 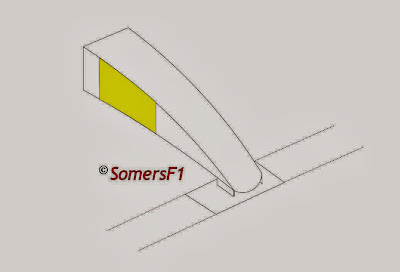 The regulations now require the most forward point of the nose to be no higher than 185mm from the reference plane whilst it's highest projection can be no more than 250mm. 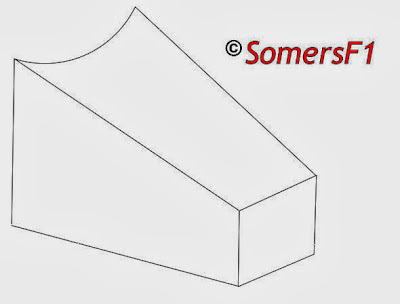 Furthermore at a point 50mm rear of the tip it must project a surface area of at least 9000mm². 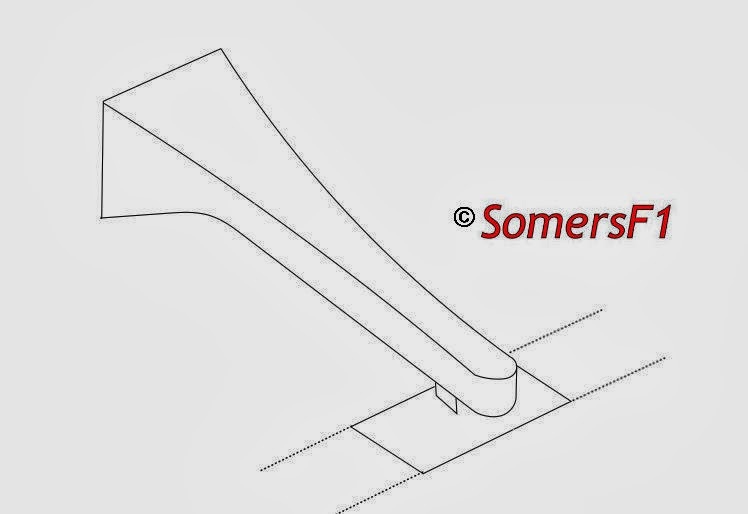 The next dimensional movement of the goalposts that effects the nose is the lowering of the chassis' bulkhead maximum permitted height, from 625mm to 525mm. Now not all teams run to the maximum permitted heights but they certainly lie in a position between those two dimensions. This will also have a knock on effect aerodynamically but moreover change the drivers point of view and angle he sits at in the chassis. 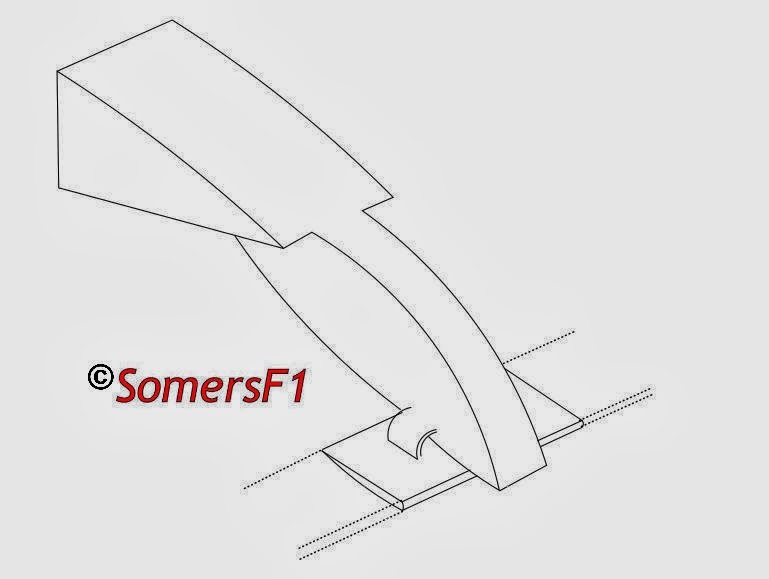 As we can see from my mockup above though there is still the viability to have the rear of that portion of the monocoque at the 625mm height. 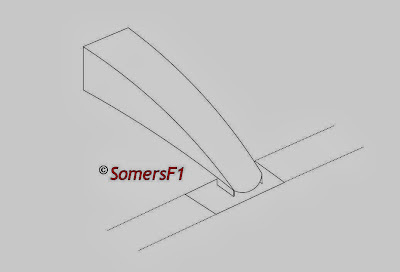 To enable that transition the use of a prescribed piece of laminate (or a vanity panel) may be utilsed much like we have seen the teams implement this year to disguise the 'Step Noses'. 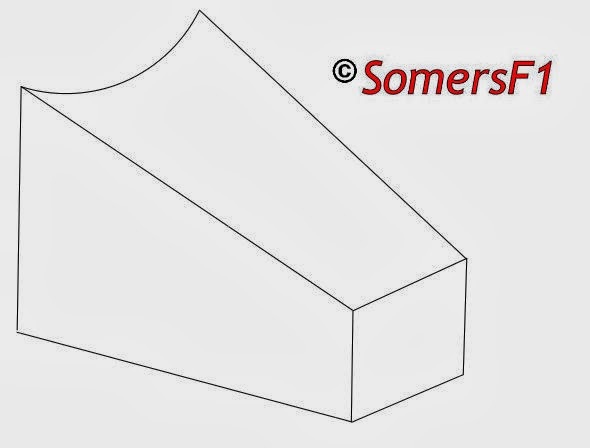 Although in the image above I’ve drawn the 'Vanity Panel' in a full wedge shape that traverses the two maximum heights many other designs can/could be used to sculpt a better effect from either the nose or the bodywork aft of it. 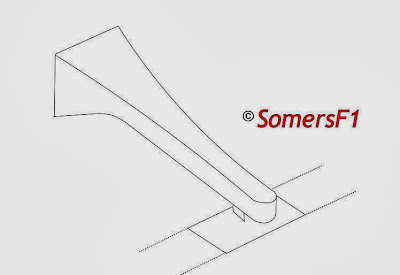 I think we are perhaps likely to see a tramline effect used by most to guide the airflow centrally (below). 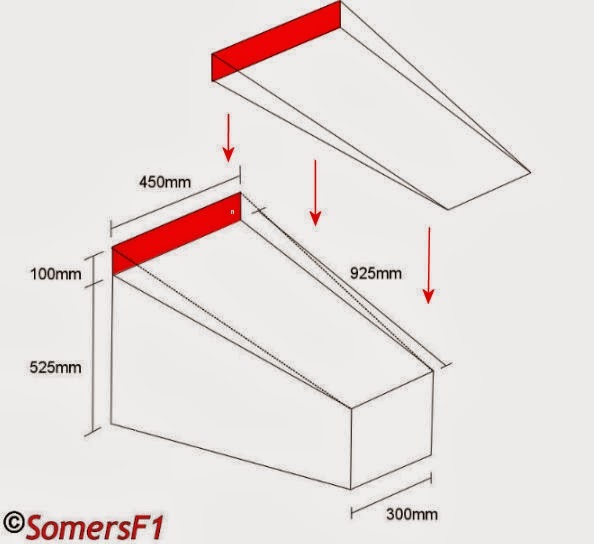 The lowering of the bulkhead height to 525mm also lessens the gap achievable between the underside of the chassis and the reference plane, again reducing the airflow space under the car by upto 100mm. Craig exposed the weakness within the regulations that permit the use of a much thinner tip when compared to the rear section of the nose. Although fairly ungainly in appearance it does raise the questions in regard to the shaping of the central portion of the nosecone which can then splay further back. The use of a similar design will likely be fairly widespread as with the loss of exhaust blowing at the rear of the car there is a premium placed on getting airflow rearward into the Diffuser. My original sketch of the 2014 noses bears a large resemblance to Craig's illustration but also shows how interpretation can lead to differences. 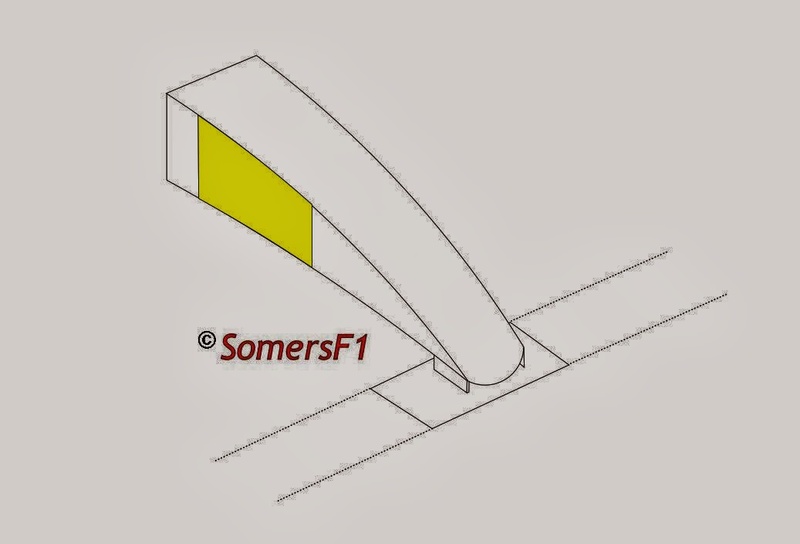 For example we also have to consider to the impact of other components like the Front Wing pylons (the connection between the front wing and the nose) which can also be shaped differently for a differing effect. The crooks of the nose shape will very much be determined by what the team can achieve in terms of the internal crash structure. 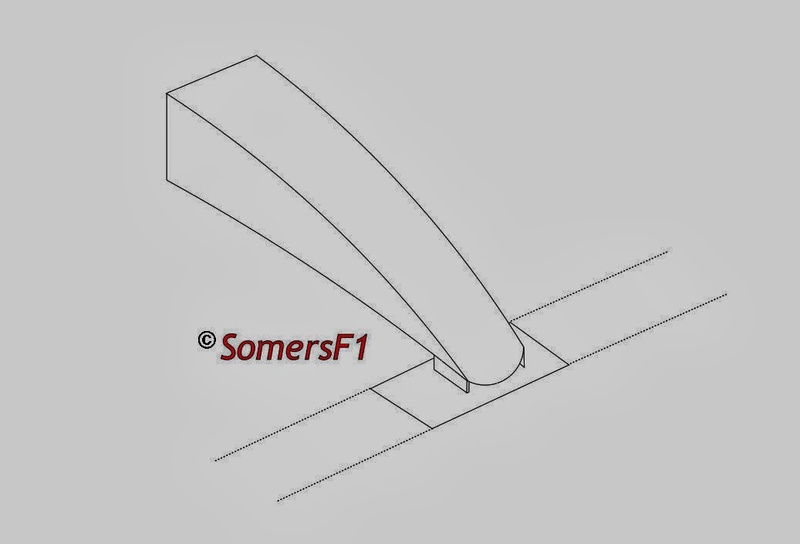 In the image above I've constructed the type of structure the teams may be outwardly working from when modeling their 2014 noses. 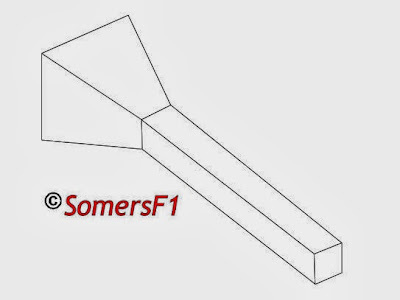 For 2014 the FIA have also curtailed the use of the FOM camera housings to gain an aerodynamic advantage. 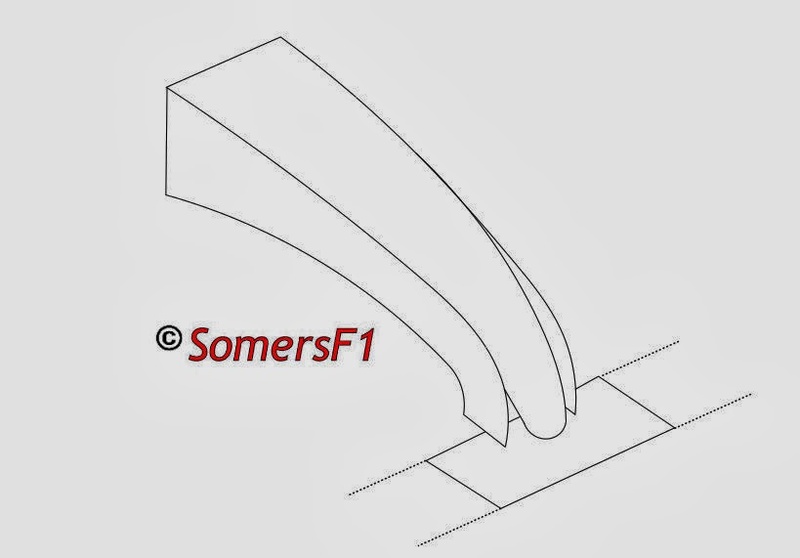 Red Bull have for some time now utilised the position of the camera's either side of the Nose tip, whereas many others have positioned them behind the central mandated section of mainplane to get an advantage from an area that's designed not to get one. For 2014 the camera housings position is set at 150mm to 450mm forward of the front wheel centreline and between 525mm and 325mm above the reference plane. I've marked out (roughly) the legality box in yellow on the diagram above, however don't think that's the end of gleaning an advantage from the camera housings. Although their position is dictated in the regulations I'm quite sure teams will continue to leverage an advantage from them depending on the shaping of their nosecone and could even design them to sit within the frame of the nose to aid in airflow distribution. 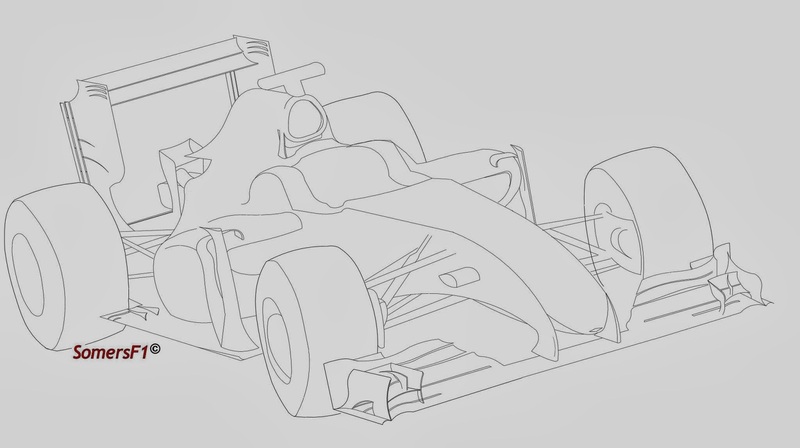 As with everything in Formula One most of the designs seen in testing / early season will likely be very similar. However there will be several designs that stand out as different, it will then be a race to decide whom has applied the regulations best and by changing the nose layout how it would affect the aero balance of the car. 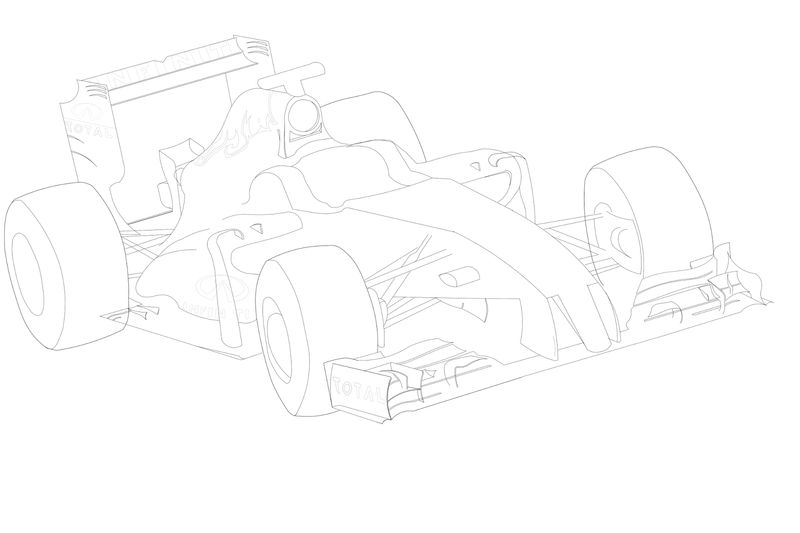 As an idea of how quickly a design can evolve lets look back at the launch of the Red Bull RB5 which featured a very slim and pointy nose, by the time team we reached Silverstone in 09 it looked decidedly different. This was probably in reaction to the changes to a DDD at the rear of the car but even so it goes to show how changes need to be made to balance performance. The design of the nose still has tremendous scope and so I could sit and draw out many variations but here's a few more sketches I did just to highlight that fact, all of the sketches are far from refined but offer an insight into what's acheiveable. Whilst in the same region it would be rude not to talk about Turning Vanes too, these are the vertical appendages employed by the teams beneath the Chassis/Nose. Their design has of course become more intricate since 2009 with teams now utilising upto 3 tiers in their design for efficiency. The Turning Vane is utilised in order to create both a barrier for the airflow spilling off the tyres (especially in Yaw) but also to condition the centralised airflow onward to the Splitter and Floor. Although the reduction in height of the chassis obviously minimizes their installation height I still suspect we will see them applied. Their positioning will very much be dictated by the deformation of the tyres, as we have seen over the last couple of seasons teams have started to move them rearwards under the chassis. I plan to get to as many of the 2014 car launches as is viable and also have an eye on making at least one of the tests. This however all costs money and so if you enjoy reading my blog and feel you can help to support financially I'd very much appreciate any donations you make (big or small). Donations can be made via the paypal button in the right hand side bar of the website.